The face is subject to analysis in 2 specific ways: the profile view and the frontal view. 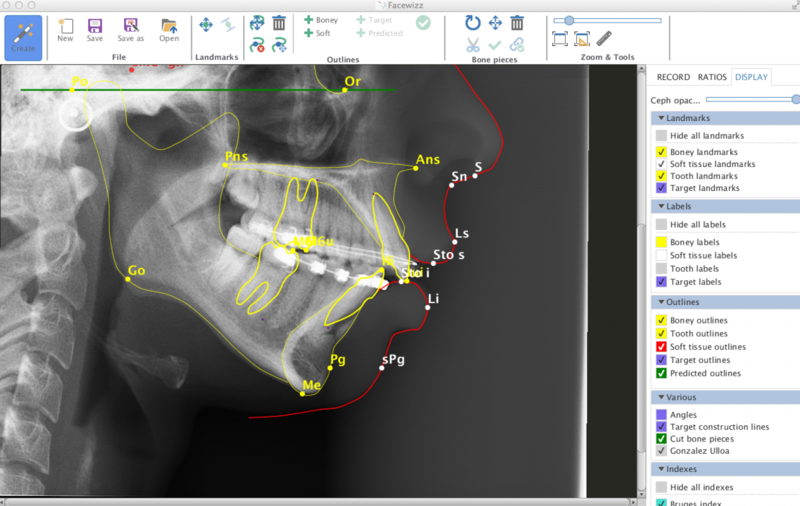 Reducing the anatomy to 2 dimensions via radiographs, photographs, or monitor-screen views of CB-CT imaging, enables facial assessment on a flat surface. 2D photos or cephalometry captured at actual size must than be correlated with 3D clinical anthropometry. 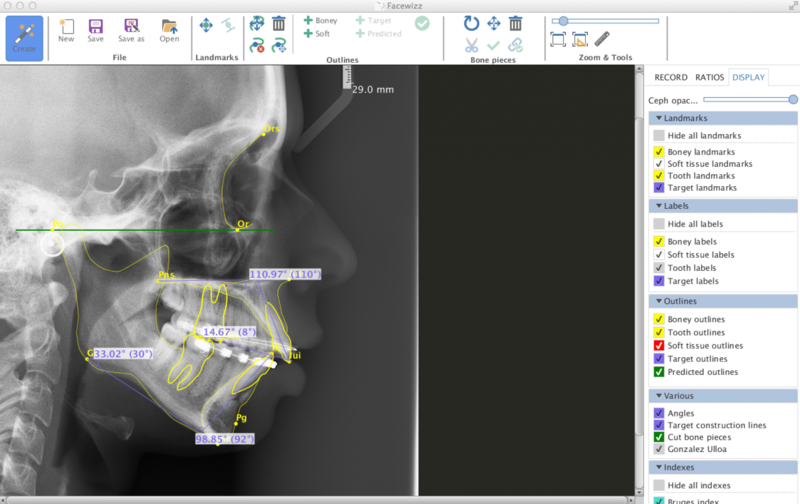 3D orthognathic surgery software also plans faces in a 2D represented profile and frontal view. Patients do not request an holographic representation of the planned result! They are pleased with a simulation of the predicted result on the profile photograph (sometimes frontal photograph). Surgeons are pleased with a program that can quickly show effects of jaw rotations or chin segment repositionings on the soft tissue target line. This is exactly what Facewizz offers! 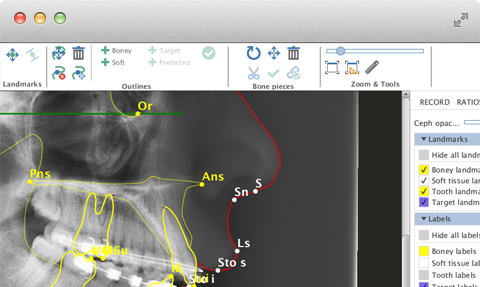 Facewizz offers collaborative research on hard/tissue tissue ratios for selected previewers. More information follows soon. A quick analysis to find out if the case has a long or short face, and how much orthodontic decompensation has been achieved. Landmarks, labels and lines can be selectively hidden. 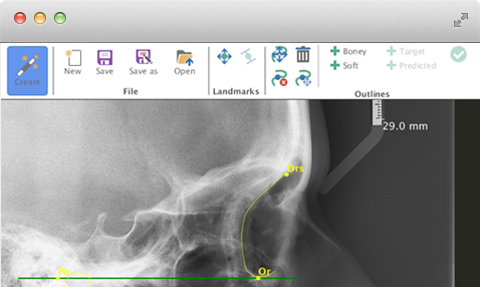 For obtaining third dimension data valuable for chin profile prediction, 2 tools are useful. A Tessier anthropometric caliper (Stryker-Leibinger) facilitates measurement of facial width (zy-zy). An optometer (e.g. Nidek PM-60) allows for accurate measurement of the interpupillary distance. Tutorials like this one on "record taking" adhere to the principle "Show one, do one, teach one". The osteotomy tool is explained. Debugging freeware. Nothing is charged at this moment. You can order as many as you like for free. Copyright © Orthoface R&D GCV. All rights reserved.